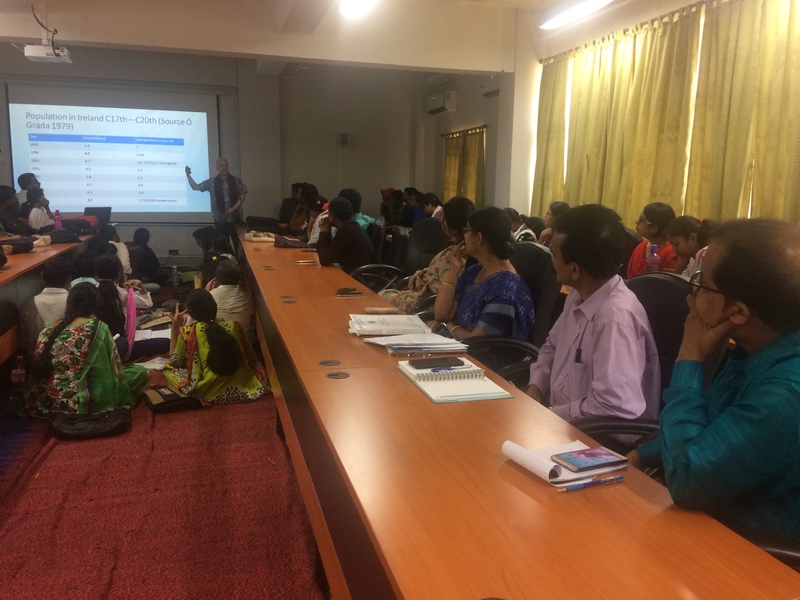 Island Voices co-ordinator Gordon Wells’s “lightning tour” of India concluded with a session in the Bhasha Bhavana (Languages Building) of the world-famous Visva Bharati University at Shantiniketan. Wearing hats from both Guthan nan Eilean and Soillse (for which he is the project manager), Gordon Wells delivered a summary of the overall Island Voices project while highlighting the partnership with Soillse, particularly in relation to Saoghal Thormoid. 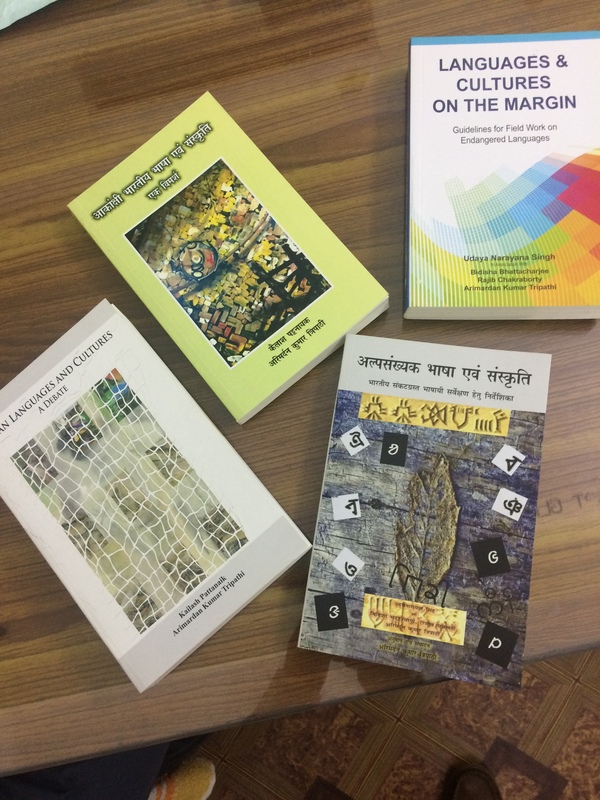 Like the previously visited Jadavpur University in Kolkata, Shantiniketan also hosts a Centre for Endangered Languages, another link in a chain that connects many different parts of India. 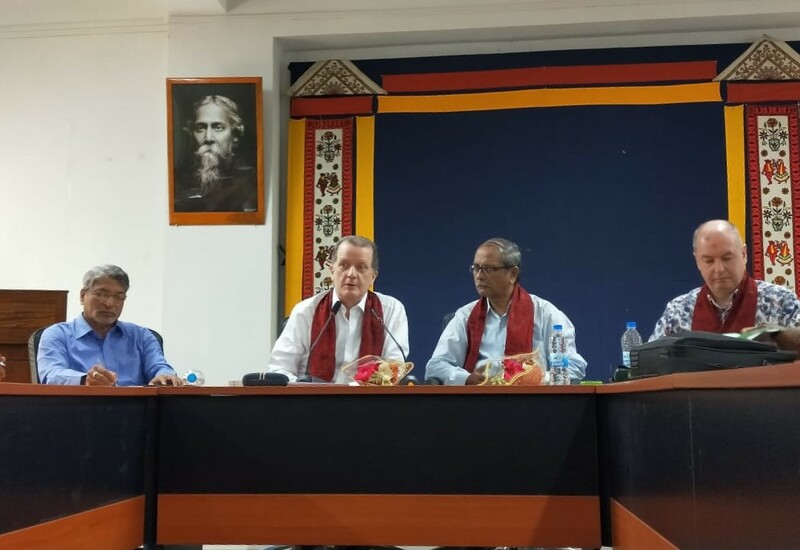 Soillse Director, Conchúr Ó Giollagáin, who also spoke in all three venues on the tour, is keen to develop dialogue and links between Irish and Scottish Gaelic interests and Indian efforts and initiatives to protect and promote linguistic diversity. In his talks on Irish and Scottish Gaelic culture and demography he noted in particular the striking disparity in international academic attention and resources devoted to India, with its rich mix of languages and cultures, in comparison with, for example, Western Europe which has far less linguistic variety. Both visitors certainly found Shantiniketan an inspiring venue to complete their tour, where they were warmly received by faculty members, research scholars, and students, and treated to a fascinating tour of the campus, as well as Rabindra Bhavan, which houses the Rabindranath Tagore museum. A PDF of Gordon’s presentation with live links can be viewed here. This extract from Saoghal Thormoid, particularly in keeping with the theme of the Indo-Scottish colloquium at Amity University Haryana, was used as the final example in Gordon Wells’s second presentation, in which he was invited to speak on aspects of Video Documentation in an ethnographic context. The PDF of the presentation, with live links to further exemplifying material is available here. Teul-film berr evit an deskidi diwar-benn Sabhal Mòr Ostaig, Skol-Veur C’houezelek Bro-Skos. Film aithriseach goirid ann am Breatnais airson luchd-ionnsachaidh mu dheidhinn Sabhal Mòr Ostaig. Short Breton documentary about Sabhal Mòr Ostaig, Scotland’s Gaelic College. Many thanks to Fañch Bihan-Gallic for the latest “Other Tongues” addition to our Sharing Gaelic Voices theme! Fañch is also a keen Gaelic scholar, with an interest in the informal learning of the language. And outside his formal studies he is an active member of the Misneachd campaign group. Raw video from the Facebook page. “Guthan gu leòr aig geamaichean Uibhist a Tuath. A taste of the North Uist games, with plenty singing on the pipes.” The unmistakable soundtrack to Island Games. Among the 200+ Island Voices videos on YouTube, the documentaries and interviews on peatcutting, featuring Archie Campbell, have constantly attracted a steady, if not eye-catching, stream of hits. Slow burning, you might say, like the stuff itself. Well, there appears to have been a shift in the wind in the YouTube algorithms, judging by recent analytics for the English version of the documentary. This looks more like a muirburn out of control! Suddenly, viewers all round the world – from the United States to Sweden, to Romania, India, Indonesia, Brazil and elsewhere – are taking an interest in how peats are cut in Benbecula. It’ll be interesting to see how many move on to listen to Archie talking about the process and the social customs attached to it in either English or Gaelic – all available on the Series 2 Outdoors page. And any Polish-speaking viewers can also get a version of the documentary in their own language – Kopanie torfu! A year has passed since Ceòlas’ Liam Alastair Crouse last spoke to Gordon Wells about his work in Uist. He took time out from helping with the latest immersion course for Gaelic learners at Kildonan Museum to talk about what he’s been doing. He’s not been idle! Part of his work involves helping organisations (local and national) develop their Gaelic, particularly online. Here are some of the sites he mentions. He then goes on to mention the latest initiative to help Gaelic learners in Uist – a listing of likely places where you might hear and practise the language, together with some helpful tips on how to engage in Gaelic conversation. You can download and print off the guidelines here. It’s also available on the Ceòlas site here. In the final part of the conversation with Gordon he talks about further plans for local development. Watch this space! This is a very nicely made video from Comhairle nan Eilean Siar’s Multimedia centre, with Liam Alastair Crouse making some well considered points about learning Gaelic. It may not be the easiest task in the world – but the rewards for success are worth noting!